Wikinomics has a great post about the dominance of English on the Internet. The data and chart for the post come from the really useful www.internetworldstats.com, and in particular from its Languages reporting. 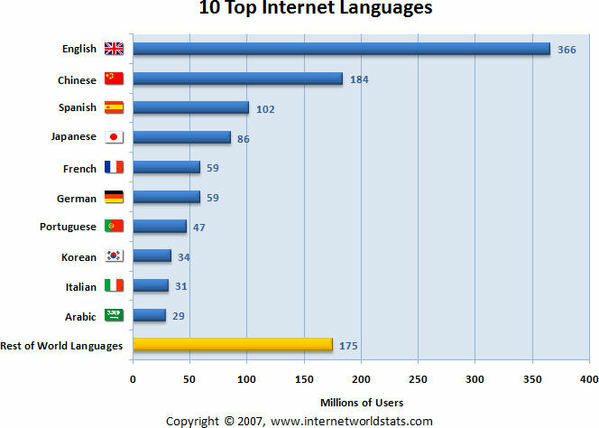 The chart above, and the stats on the website, show that 31% of Internet users by language are using English. Since 2000 the growth in the number of people using English has been 158%. However, the growth amongst many other language groups is greater. Chinese has grown by 470%, Portuguese by 525%, and Arabic by 940%. Another way of looking at the stats is to compare how many people speak a language and how many of those are using the Internet. Amongst 129 million people estimated to speak Japanese, 67% are Internet users. Amongst other language groups the high scorers are: German (61%) and Italian (53%). Amongst the 2 billion English speakers only 18% use the Internet, and amongst the 1.35 billion Chinese speakers only 14% use the Internet. I think we can take it for granted that this picture will evolve. CyWorld is a Korean social-networking site that has already managed to persuade one-third of online Koreans to register (90% of Koreans in their 20s are users). According to Business Week, CyWorld is poised to take on the US market and to increase competition and innovation. CyWorld differs from sites such as MySpace and Bebo by being more ‘cute’ and also by the aggressive way it sells downloads and add-ons, Business Week estimates the annual revenue for sales as US$120million. One of the features of CyWorld is its use of avatars to help express moods and emotions. The ability to dress, arrange, and buy accessories for avatars is credited as one of the reasons CyWorld is so popular with females. One of the key associated services with CyWorld is NateOn, an instant messaging service, that rivals but is not compatible with MSN. It will be interesting to see whether the US is willing to adopt NateOn, even if it adopts CyWorld. The BBC report that US company Zango has been fined by the US Federal Trades Commission (FTC) US$3 million for illegally downloading its adware onto the unsupecting PCs. The charge was that the software had been downloaded more than 70 million times and had caused 6.9 billion popups. Zango, previously known as 180 Solutions, had been using third parties to help download the adware and was accused of 'making it difficult' to remove the adware. Zango have alleged that the problem was with the third parties and not them, and that they have been sticking to the law since January 2006. It is nice to report when governments do something right, and this is one of those occasions. If you are looking for a great first resource for finding out a few key facts about one or more countries then try out the CIA’s Word Factbook. The online book contains basic reports on 275 countries and is regularly updated. One of the useful things about the Factbook is that it stores the same information about each country in broadly comparable formats. Nielsen/Net Ratings have reported that 50% of the top ten websites in the US in terms of growth in the year to July 2006 were user generated content sites, such as photo sharing, video sharing, and blogging. The top UGC site was ImageShack, which was ranked at number 4 and grew 233%, from 2.3 million visitors to 7.7 million. In many ways the most impressive growth came from MySpace, ranked 9th, which grew 183% from 16.2 million to 46 million, what makes this so impressive is that it is the only one of the largest 10 sites to have grown by more than 23% (Google grew by 23% in the year to July 2006). By contrast older top ten goliaths showed little growth, Real Networks +3%, AOL +1%, and Microsoft -5%. The most visited site remains, for the time being, Yahoo, with 106.2 million visitors, but it only grew by 8%. At these rates of growth it won’t be long before the 10 largest sites are dominated by User Generated Content sites, such as MySpace, YouTube, and Wikipedia. UK newspaper the Observer has published its list of 15 websites that have changed the world. By the Observer’s reckoning the Internet is 15 years old this month and they have celebrated by getting their net specialists to come up with their list of the 15 websites that have changed the world. One of the striking things about the list is how many of the top places go to Web 2.0 type sites, many of them relatively new. Key positions go to Wikipedia at number 2, napster at number 3, and even though it was only created in 2005 at number 4 is youtube.com. The top position for a conventional Web 1.0 site was Amazon at number 9. Google and Yahoo (Web 1.0 type sites that are working hard at becoming Web 2.0) were 13 and 14. Each ranking is supported with interesting and informative background and the whole article is worth a read. And, the number one position, with 168 million users worldwide, eBay.